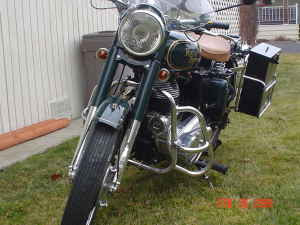 A special 2006 Royal Enfield Bullet Classic for sale on CraigsList in Yakima, Wash. caught my eye. 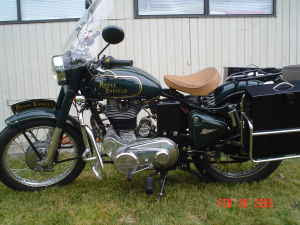 It is very clean, tastefully accessorized, and the body color pannier boxes in shiny carriers are unusual. It is advertised as having 1,100 miles, always garaged and in great condition. I wrote to ask for more details but was unprepared for the touching response. "My brother purchased the bike on Sept. 12, 2007," Mike Munly wrote me. "He rode the bike for about five months and put 1,100 miles on it. In May of 2008 he got very sick and could not ride the bike any longer. While in the hospital he would talk about the bike and said that he couldn't wait to get home and ride it again. Unfortunately he never did go home and ride the bike again. 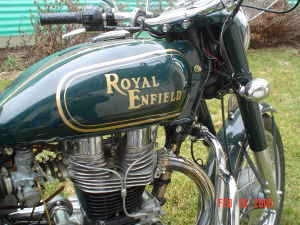 He passed away on Sept. 12, 2008 exactly a year to the day he bought the Royal Enfield. It is ironic that his warranty and the Royal Enfield's warranty ran out on the same day. "My brother's name was Wally Munly. He was 65 when he passed away. We have kept some of his things like a few of his favorite guns and some of the tools. He was a good mechanic and liked the outdoors. "He loved to motorcycle and throughout his life he had a number of them. I remember when he was a kid he rode Indians and BSA's. He always had a passion for those bikes and the Royal Enfield gave him that same feeling. "It is a big regret that we don't have a picture of Wally with the bike. When he bought it and brought it by to show it off, none of us were thinking that he wouldn't ride it for years. It is a reminder to us that life is truly short and we shouldn't take things for granted. "As I was working with his things after his passing I really for the first time got him. Like your other readers, he has the accessory manuals and the service manual and I know he spent many hours going through both of them. "I don't want to take up all of your time but it is still hard to believe that Wally isn't there for the family things. He was in the hospital for four months and I saw him at least once a day and many days more than once. I think we all got to know and understand him even better through that time. "Sometime during his last week he had a very good few hours. My wife and I were talking to him about his bikes and cars and I made the statement that he was 'hell on wheels' He broke out into a big smile and shook his head as if he was remembering some of the things that he had done. He did things his way but he always had friends. Some of his old riding buddies have called to talk about him and share their stories." What a great memorial note. Thanks for posting David. What a great story. Thanks for sharing your brother's story with the blog, Mike. 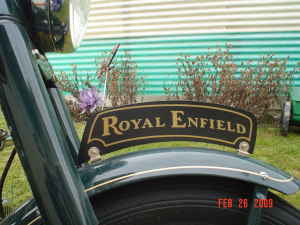 I just wanted to drop in and tell everyone that I am now the proud owner of Wally's Enfield. It's just a beautiful machine- I plan on leaving Wally's tax card on the bike in his memory. It was a pleasure to meet Mike and his wife-fine folks. Anyway, I'm happy to join the ranks of Bullet owners, especially this particular one and will ride and maintain it proudly in Wally's memory. Wow, Shane, that is a really fine sentiment. Thank you for posting this and best of luck. Hopefully it will bring you a lot of happiness.